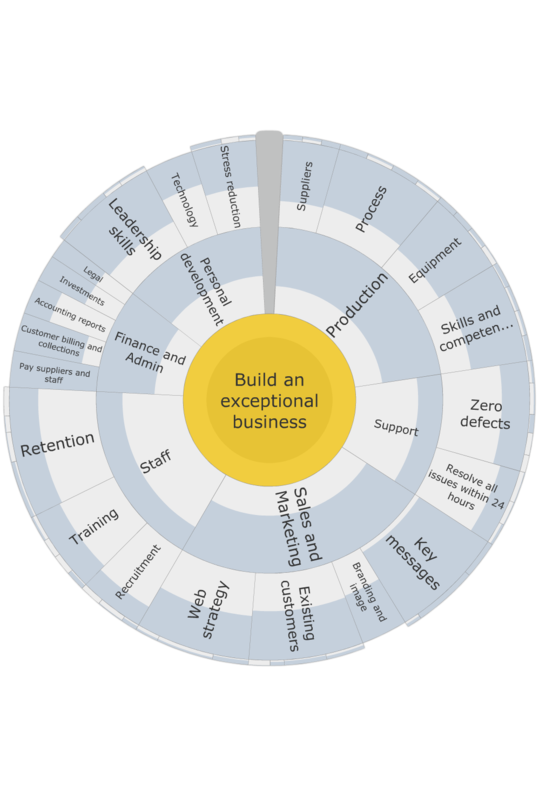 I want to use goalscape within my work environment and want to get as much buy in as possible to this great tool - As a minimum, can I remove the goalscape logo or ideally add our own company logo? Thanks for your inquiry – and for your advocacy of Goalscape! If you need anything else please post again. PS Incidentally your message here went into our spam filter – hence the delay in responding. You can avoid this happening in future by creating an account on this forum by clicking the 'Create a Profile' link. You will be logged in automatically when you visit the forum and you will be able to see a list of all your discussions (as well as being able to access all the public ones posted by others) – and your messages will never be misidentified as spam. I followed your advice (both forum login and logo change) - Thank you. The key thing for me - and aligned with one of the other forum postings is that I remove as many barriers as possible to maximise support at an Exec level - Can we remove, or ideally change the title "Goalscape report" from the outputs? I know it seems like a small thing but it really would increase the chances of broader adoption if I could rename the reports to something like "Progress report" or "Status report" etc. Yes – all your messages are still going into the spam filter! After you registered on the forum you will have received an email: you need to click the link in that email to confirm your email address and complete your registration here. I have deleted your duplicate messages. To answer your question about the Goalscape logo in the exported report: we are indeed considering changing the title page layout and contents. In the meantime you can edit your DOCX report to replace our logo with yours – and if you want a PDF copy, you can use the Save As PDF facility in Word to generate a PDF version. If you would help set me up on the forums that would be a great help - I would like to provide feedback and get the most out of the forums. Sorry you are still having trouble registering with this Tender Customer Forum. When you say "it still doesn't let me post", please could you confirm whether you are trying to post using the Reply box on this discussion here or by Replying to the email notifications you are receiving? Depending on your answers to the above questions I will escalate this to Tender. Thanks for your patience and cooperation here. Quick follow-up: we have changed the Title page in exported PDF and DOCX reports so it shows the Main Goal name at the top, rather than the word 'Goalscape'. 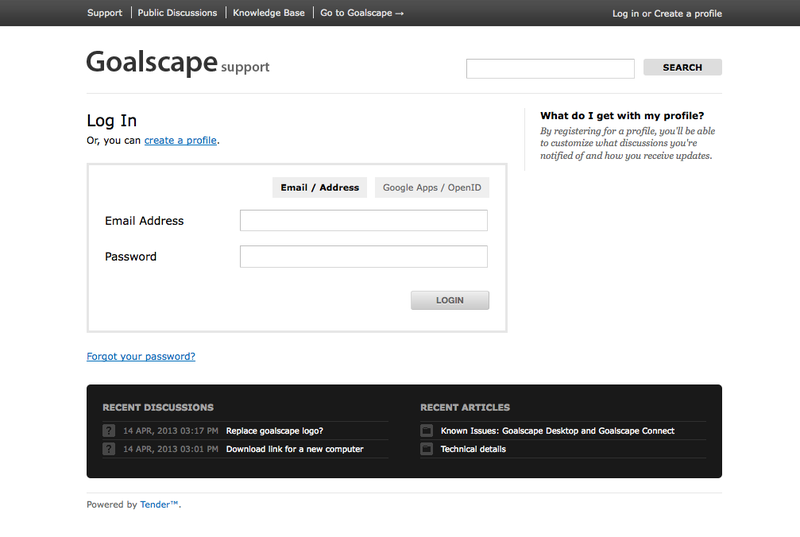 Here is a Preview copy of Goalscape Desktop for you to test. Download this .air installer file to your hard drive (you may need to enforce the '.air' suffix when you Save, as some OS try to change it to '.zip'!) and run it with a double-click. It will install seamlessly over your existing version of Goalscape Desktop; and when we release the next Public Update, that will install over this one. If you wish to revert to the Public version at any time, you can download it here. Please post again to let us know if this works for you. Just tried to open this on my work PC and although the zip file seems to be ok, when I open the unzipped folder the Goalscape Desktop installer seems to be a shockwave flash (swf) object rather than .air and will not open with any program I have installed. I tried just adding a .air suffix thinking this might force the file to associate with adobe air but this did not work I have Goalscape on my machine but I must admit the last version needed IT team assistance to do something. I use Windows XP at work. The file I posted here is NOT a zip file, it is an AIR installer file. As I mentioned, some OS try to change the suffix to '.zip' during the download, so you need to enforce the '.air' suffix when you Save it. Then you can run it simply by double-clicking it. I have merged your reply here (which was from a different email address) with your original discussion. As you requested separately I have also removed your details (even though this is a Private discussion, inaccessible to anyone else). Thanks for clarifying both points - I am a newbie to forum postings so didn't know this was private but thanks for removing my details all the same. Installed file and tested PDF and word versions - All working fine for my needs - Thankyou. Great, glad it is all working OK for you now. You said "sub goals % complete visual not flowing through to central visual progress". If you are referring to the progress shading, it certainly should appear in the central goal (see attached screenshot). If that is not how it appears for you, please post here with a screenshot or the exported PDF itself. Are you still developing / enhancing Goalscape? I notice the latest version did not include the changes you made in the r3145 version you have here. Yes, we are indeed continuing to enhance Goalscape! The feature you are requesting here will be in the next Updates for Goalscape Desktop (due out very soon) and is in fact already in the online version Goalscape Connect.